Food Truck Tuesday at Haulover Park is a great way to taste Miami’s diverse cuisine. The family friendly event also has live music and fun activities for the kids. Miami has always been known for its amazing cuisine. The diversity of its people means a variety of food from all over the world that tantalize the taste buds. A great way to experience this large range of food types is by visiting the Haulover Park food trucks. The food truck scene in Miami has been growing throughout the years and one of the most well-known meet-ups is at Haulover Park. The park, located just north of Bal Harbour and about a 20-minute drive from South Beach, has a large kite-flying area where food trucks gather every Tuesday from 5pm to 9:30pm. The weekly event is known as Food Truck Tuesday. There are usually over 15 food trucks, ranging from BBQ to fish tacos. There’s also a live DJ and bouncy houses for the kids, so it’s a really fun thing to do with the family. Food Truck Tuesday is fun for the whole family! The only bad thing about the food trucks is having to choose which one to eat from! I went with my brother and we agreed to eat from different trucks so we could share and try a variety of food. I chose to eat from Mr. Good Stuff, which had Venezuelan cuisine. I had a Bella Bambina Caprese (an arepa stuffed with fresh mozzarella , tomatoes, basil, and balsamic vinegar) for $9 and a Cheezy-My-Neezy (fried cornmeal bites stuffed with 4 cheeses) for $5. My brother ate from FOAR and ordered the Indonesian Mei Goreng. Then for dessert, we ate again from FOAR and ordered a Nut Job PACO (a pancake formed like a taco that was filled with bananas, nutella, whipped cream, and hazelnut dust). It was all really good! Pro Tip: Check out these Free Things To Do In Miami! 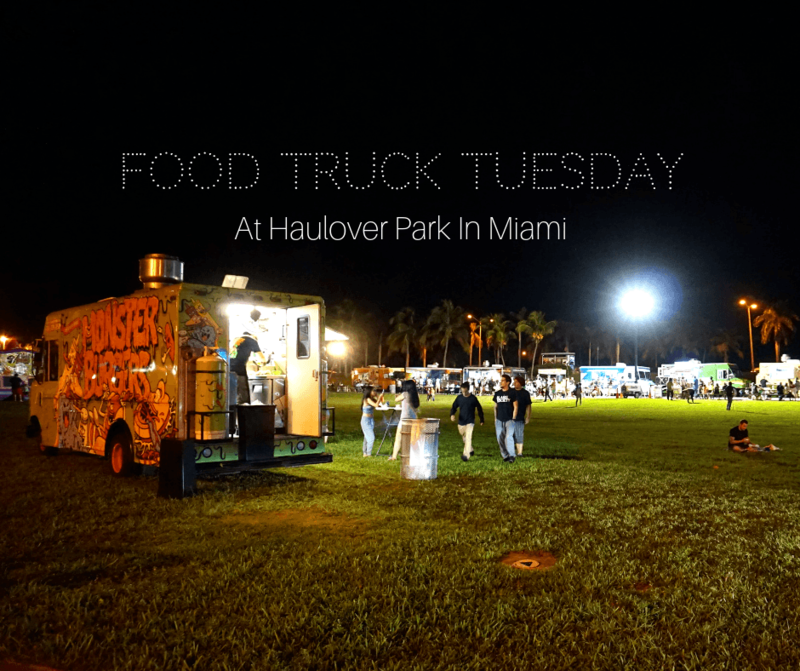 So the next time you’re driving around Miami on a Tuesday night, stop by Haulover Park for Food Truck Tuesday. You’ll experience some great music, a fun atmosphere, and a lot of fantastic food. My husband went to Miami last year and could not stop raving about the food trucks! Me, I love the food truck culture in general and I think I’d really enjoy it. How cool is a food truck meet-up?! Never heard of such a thing! Would love to try all the different dishes, yummy! I love food trucks!!! When I was in SF and LA I would literally hunt them down. That dessert though. Got to get my hands on those! This looks like so much fun and the food looks delicious. I’ve seen lots of food trucks in Hawaii but it wasn’t this busy. Now I want to visit just for the food. This is definitely a great place to hang out in. So many food to choose from! I love food trucks a lot. It’s great to have so many options! Omg the food here looks so good. I want to do to Miami, and a big reason is just to eat. There aren’t a lot of food truck meetups where I live (they happen a few times over the summer), but I definitely learned for the summer food festivals to go with a couple of friends and split the food, so you get to try a little of everything. I have not heard of a food truck meet up before, but if I could get in on it, I would. 🙂 We have a dedicated block of food trucks in my city that we can visit any time, but it doesnt look anywhere near as fabulous as this. Last food truck feed I had was a Vietnamese noodle salad bowl… drool! Food Truck Tuesday, I am there!! The only problem would be choosing!! I know! It can be so hard to choose just one! The food looks sooooo good! Makes me wish I lived closer to check it out. It’s great that they make an event out of it with music and activities for kids. Hi Lara! Yes, it’s fun for the whole family! That caprese arepa looks absolutely mouthwatering! And that paco sounds yummy, too. What a fabulous find! MMM I love food trucks so this would be my dream! Although I agree that it would be very difficult to choose where to eat! There are worse problems to have lol! That’s so cool, wish we had something like this! The food looks so good! I think the food truck scene will continue to grow, so you may have them near you soon! I enjoy eating from food trucks. What a great idea to have a variety in one place. Definitely sounds like a good time for the entire family. My brother used to talk about this all the time when he lived in Miami. I’m sad I never made it there. I love food trucks and this seems like a great way to try multiple cuisines in one place. I’m a big fan of food truck gatherings. They allow us to try a little bit of everything. I’d definitely love that Paco, too! Nutella…. mmmm!! I know! It was delicious! The best event in South Florida is food trucks Tuesday’s event at haulover park.